Other protests have been held across Germany’s major cities, including Cologne, Frankfurt and Munich on Saturday. Local media showed protestors gathering at Berlin’s Alexanderplatz square. Saturday’s protests are expected to last till 5pm Berlin time. Rents in Germany’s capital have doubled over the past 20 years and have spiked in other cities across the country. Anger has also been directed at private landlords with large property portfolios. A backlash appears to be growing as an organisation targeting real estate groups begins a petition in a bid to push for a referendum on the issue. Support on banning large landlords is growing, and so too is the idea of turning all property into the hands of social housing. The 'Expropriate Deutsche Wohnen & Co' initiative, named after the biggest private firm acting as landlord in Berlin, targets companies with more than 3,000 apartments in their portfolios. Of an estimated two million rental apartments in Berlin, Deutsche Wohnen owns 111,500 (some 6.8 percent of Berlin’s rental properties), followed by Vonovia with 44,000. Average rent for the smallest apartments in Berlin Mitte (central Berlin) cost approximately €839 per month, while the biggest per square metre on average cost €1890 per month. According to Statistica, apartments in the district of Friedrichstain, an area lined with Soviet-era housing and attracting an international crowd, can average €1,663 per month for a 100 square metre property and €2,628 per month for apartments bigger than 120 square metres. 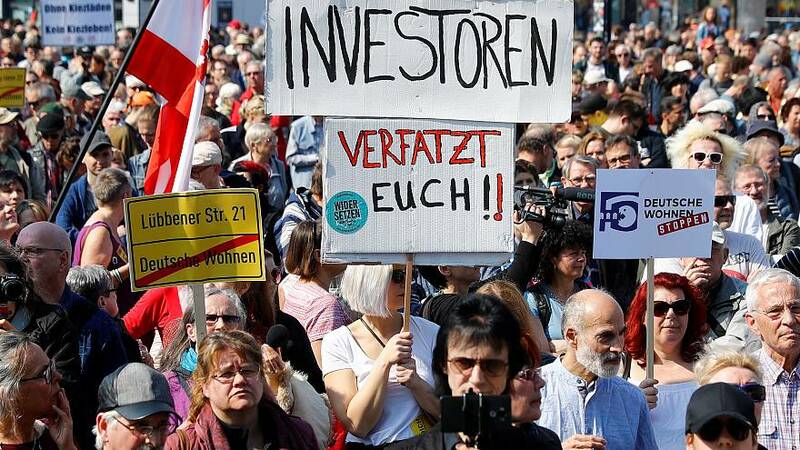 While Berlin rent prices still lag behind other European capitals such as London and Paris, campaigners have warned of a “class struggle” taking place in Germany. "Many say this is a type of class struggle. Yes, that's what it is. But we did not start it. We are taking defensive measures against the class struggle from the top who has for years been fighting against tenants," campaign spokesman Rouzbeh Taheri told German media. Campaigners believe that landlords and cooperation’s are swooping in precisely because Berlin’s position behind London and Paris. "It is about sending a signal on which direction the city wants to go. And a signal to speculators — telling them that your capital is not safe in Berlin," Taheri added. According to the most recent statistics from Statista (2015), 48 percent of Germans rent and 52 percent are home-owners. Most renters live in apartments. In some Germans cities, particularly Berlin, rented blocks are often separated by an inner courtyard, giving Germany’s renters a unique community feel that many renters in other European capitals say is lacking. Euronews's correspondent in Berlin Emmanuelle Chaze told Good Morning Europe that authorities in the capital were unlikely to heed calls for properties to be repossessed. The demand is backed by the far left Die LInke party - and members of the right-dominated Berlin Senate accuse it of wanting to return to Soviet-era policies.